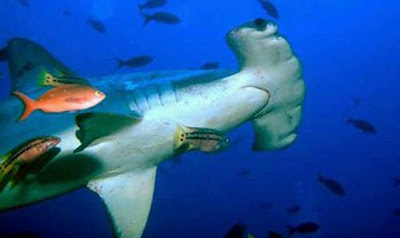 Long-time readers, obsessive fans, and casual browsers with impressive intuitive skills might know that I love sharks. I’m fascinated by them. So, inspired by an article I read yesterday, I’m foregoing the humor for the day. Instead: 7 amazing sharks facts, and 1 terrible one. 1. Lantern sharks can glow in the dark. 2. Many breeds of shark have a 6th sense, enabling them to sense the electro-magnetic energy of living things. 3. 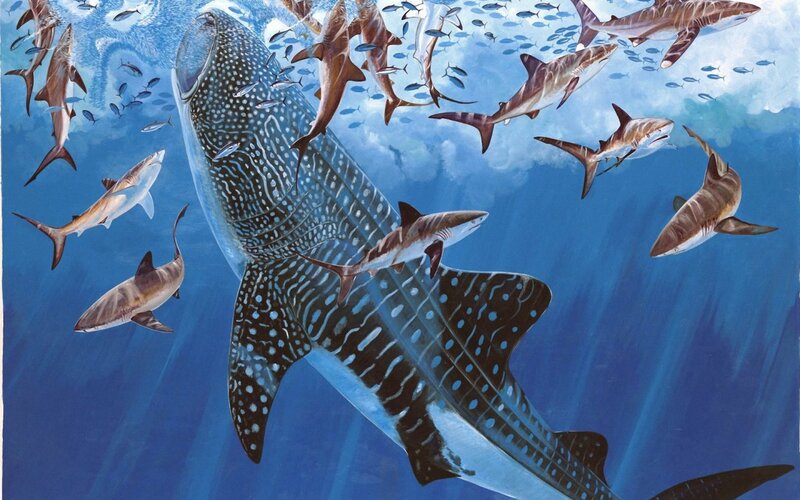 Sharks have existed, virtually without change, for almost 400 million years. 4. Despite this, surprisingly little is know about them, Great Whites in particular. Theories on how long they even live in the wild is even pretty speculative. 5. Some species of shark sleep by shutting down one half of the brain at a time, leaving the other half conscious, aware, and even rendering the shark mobile. 6. After mating, some female sharks can retain the male’s sperm in their bodies for use when she is ready to reproduce, even if that does not happen until next season. 7. Whale sharks weigh an average of 13 tons at adulthood. 8. In 20 years, most species of shark will be extinct unless something changes. Around 100 million sharks are killed by people every year either directly (for recipes like shark fin soup, or simply for fun) or indirectly (caught in fishing nets). Your last paragraph made me think of The Cove. It’s sad. “The Cove” is one of the best documentaries that I’ve ever seen. I highly recommend it to anyone who cares about the world in which we live. Ugh, The Cove is agony to watch. Really well made, but agony. 20 years? 20 years?! I’m going to shut off both halves of my brain, stick my fingers in my ears, squeeze my eyes shut and pretend I didn’t just read that. I suppose I can put my shark fin soup on the back burner and get involved. One perk to giving to the Ocean Conservancy (or whomever) is if the sharks, or jellyfish, or giant squid see your Donor Sticker they leave you alone. True story. 20 years? Shark fin soup? In 20 years we may not even recognize the world we live in or the food we eat. So many species are in danger. I love sharks, too, unless I happen to be in the water at the time. Then I still l love them, I just want to do it from a distance. I’ve never had the opportunity to go in a shark cage. I hope I do, because I’m just really curious to know if I’ll do it. And really, how many people would watch Shark Week if they approached it all “Sharks are really misunderstood…and cuddly”? I never heard of a Lantern Shark, thanks for introducing me to this badass fish. My hope is that they will still be around in 20 years for the next generation to enjoy. It’s sad to think that humans have allowed this to happen…very, very sad, but not surprising in the least. There was a time that 20 years would have seemed forever.Now it is just a blink. What you are saying is that this could happen in our time. Not someone else’s further down the line, not born yet. It is easier to pretend something as horrific as this will never happen when we know it will happen long after we are gone. There is no more time. We, all of us, it is our responsibility to make sure this doesn’t happen. My ten year old has wanted to be a marine biologist since he was three. The Blue Planet’s cinematography could bring him to tears even at that tender age. Thanks for speaking up for the most magnificent creatures in the sea. Besides mermaids, of course. Because they look a little like people. I always wanted to marry a marine biologist, so I could be part of all the cool ocean stuff, but skip the classes. My wife is being very stubborn about this, though. She has so much time on her hands right now. And she’s just wasting it NOT studying marine biology? Not to make light of #8, because that really is tragic. But can you imagine if #6 occurred in humans? Maury Povich would be on tv 24/7. Especially if you could store up multiple samples and then choose from them, vending-machine style. Sad thing is people would rather shut their eyes and ears and hearts (willful ignorance) to the problem. K8edid is right; this world is looking to be a very different place in just a few decades. 7 billion people with voracious appetites for flesh (and flesh “stuffs”) is a sad state affairs for any species who happens to get in our cunning ways of attaining it. But the potential loss of sharks is just the tip of the iceberg. Entire fish colonies are in a state of collapse worldwide; it’s quite likely way worse that even we think it is. And no, farming fish (or any other animal, for that matter) for food is NOT the answer. DirtNKids is doing our part and then some. It’s work, yes, but it’s good work. My kids know I’m doing it for them, for their children. And they in turn for their children and their grandchildren. The collective little actions we do now will reverberate through the ages. It’s what keeps me from being sad about the news. Thank you for sharing the shark’s plight with your readership. I’m with you! I think saving the oceans might be the most difficult thing of all, because it’s so massive and not our home turf, so we don’t see the damage in front of our faces – which is generally around the moment people, collectively, decide to do something. Besides, tuna is still cheap, so what’s the problem!? Good question, except by “still cheap,” you may be referring to the price the consumer pays, the rest of the cost being passed to others (water pollution, loss of species, unregulated fishing overseas). You may also be eating farmed varieties which are fed subsidized corn (cheap food) and fish meal (uh, more over-fishing of just a different species). No, what I’m reading of late — blue fin tuna in particular — tells quite a different story. Probably worse than sharks, who may be close behind. While sharks do scare me, I still find it incredibly sad that they could be extinct in 20 years. I think many people don’t take notice because they just see the dangerous side of sharks. But they’re living things, and all living things deserve to be here. Peter Benchley has said he regrets writing Jaws, because of the damage it’s done to sharks. And they are terrifying, but it’s too bad that we’ve branded them as monsters. I think part of our fear is because we’re the Apex Predator on land, and they are in the sea – but our big brains won’t help us toe-to-fin against them. Mr. B-Man… I, too, am a shark lover. I’m horrified at what is happening to them, let alone the rest of the ocean’s fish populations. I’m a big supporter of The Ocean Conservancy and programs that bring awareness to the plight of our oceans (maybe because I’m a Pisces?). We need sharks in our oceans like we need wolves in our forests and plains. Great post today and thank you for spreading the word! See, my wife loves to point out that I’m a Cancer, and that’s why I love the oceans so much. And well said, about needing sharks (and mentioning Ocean Conservancy – I need to add that link). Thanks! I promise to return to funny. #5? Pshaw. I do that every day at work. Last paragraph? Sad and hard to fathom. I am a huge fan of sharks too. My husband and I look forward to Shark Week every summer. It’s unfortunate that aggressive overfishing threatens to push them to extinction. Like you said, the movie Jaws probably didn’t help their cause. Whenever my husband goes surfing, my kids warn him to be careful of the sharks. Some myths never die! We are a great species, we humans. We control everything we shouldn’t. I know, it’s not enough that we eat everything else, we have to take out sharks just to be mean? I often wonder why people are so fascinated with sharks. I tend to be of the mind to leave what’s under the water alone. I don’t slow down at accident sites either. Does that make me odd? No, but my fascination with them isn’t so much of the “Look at him kill that seal!” variety as I just find them to be amazing creatures. I love sharks. I love Shark Week. I have always been fascinated by what lives in the ocean that we can and cannot see. I wonder all the time what’s in those places we haven’t been able to get to. Maybe nothing. Probably not, though. I have even thought about doing the shark cage thing, but then I get pretty sure I’d pee in my wetsuit and sharks can smell that. Also fear. Probably. Nom nom nom. Re #5: now we know who invented Ambien. Re #6: that. is. a. HORRIFYING. thought. Please tell me it’s controlled by force of will, because if it’s purely accidental I am embarking on an anti-evolution thing right freaking now. Even though we came from apes and not sharks. Because I’m not taking any chances. I think the ocean is especially hard for us to comprehend because it’s 3-dimensional. our whole frame of reality is existing across the 2-dimensional plane of land. Occasionally we dig down a little bit and make a basement, or build up a little and make a building – but we really don’t think of our world as been depth as well as breadth. Makes the ocean infinitely larger. And it’s already scary big. I must say that I have mad respect for the female shark who harbors the sperm of an unsuspecting male shark until she is hard-up for money and then… BAM! Shark-Pup Support! Smart girls! Saw a cool shark the other day: the Goblin sharks which has been seen only about 75 times. Super cool! Goblin shark – I have to look that up! considering that sharks are actually my biggest fear, like whether i am near water or not- it’s very unreasonable, if i just think really hard about them when i’m lying in bed i become agitated and nervous…for years i couldn’t even go in swimming pools alone (not exaggerating at all)… in light of all that you would think the prospect of sharks disappearing would make me happy. but it makes me very sad indeed. i may not agree with their terrifying soulless black eyes and jaws of doom; but i will defend to the death their right to have them. I love sharks – especially when I’m not swimming out of my depth in the sea. Save the sharks. And get me a bigger boat. One without trawler nets. I got to actually swim with and HOLD a nurse shark about three years ago, on a trip in Jamaica. It was amazing. I’m like you: always loved the idea of them, but actually being in the water with them is Awesome in the original sense of the word. If you ever have the chance to do that, or the cage, I cannot recommend it highly enough. What a great post! I find sharks absolutely fascinating, truly beautiful creatures. I hate that they are so maligned. I’m not sure if shows like Shark Week do much to help because it makes people even more fearful. Tiger Sharks give birth to live young. While still in the womb, they begin feeding upon, each other! Ack! Preying upon animals before even being born. Now that’s a killer’s killer. I still remember a project I did in public school about sharks and I was obsessed for a while. Thanks for the shark facts! It’s so interesting the stuff we love. “Jaws” warped me so that I can’t swim in open water where anything might live below the surface. But I’m with Erynn Elizabeth in defending all sharks’ right to exist–all animals in our ravenous food chain. Going vegan is my small way of doing that. Reason #312 (or so) for me to believe humans are are among the dumbest beasts on earth: we keep extincting things. Then a new generation tsks-tsks that their forebears extincted things, and we get all lecturing and finger-pointy…and then we go on…extincting things! Shut down half the brain? We humans seem to do it all the time. That last paragraph makes me extraordinarily sad, 20 years. My youngest daughter has been fascinated by sharks ever since she saw her first “Jaws” movie. I will pass this on to her. It is tragic what is happening to our wildlife, etc. Great story, and it really sad knowing people are killing these beautiful creatures either for food or because they are scared. We need to realize that Humans are a bigger danger to sharks than sharks are to us! When we stop letting movies determine how to react, we might be able to save them. Great story and facts. I too have an obsession with sharks, and wished people would stop killing these beautiful creatures for food or due to fear. We are a bigger danger to them than they are to us! As an aspiring zoologist, I feel that we need to be made more aware of the extinction animals and humanity alike face. It is a serious matter which I feel many people overlook frequently. Thanks – and thanks for drawing attention to it. It’s not something people readily get involved with, because they’re not cuddly, we don’t eat them (generally), and there’s nothing directly in it for us to stop wiping them out. 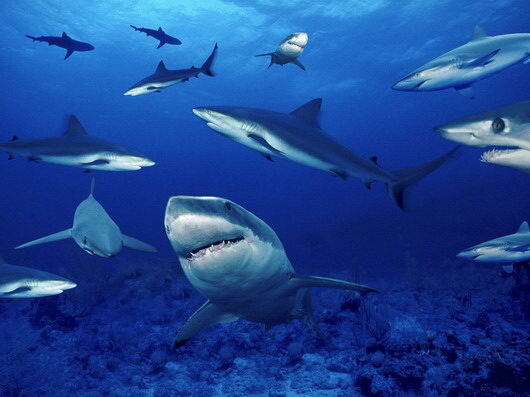 No problem – I love sharks, they’re one of my favourite marine animals & would look to study them one day. Indeed it is correct that we don’t eat them and there is nothing directly in it for us but i’d like to think that in years to come people will have the chance to see these creatures in their environment and grow found of them. I hope that like other animals which are becoming extinct that sooner rather than later people will realise that the fact that these animals are becoming extinct no matter what benefirs it has or doesn’t have for us, it is a serious event and we should take action. Our world is meant to be shared not dominated by one species. Fact 5 might mean that politicians are sharks… a conspiracy theory? This is the way we man are punishing our mother earth who never, even in a moment, fail to give us what we want and need in living.